Creating with Chrissy: HAPPY BIRTHDAY SWEET 'n SASSY STAMPS!!! 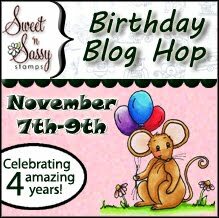 Hello and welcome to the Sweet 'n Sassy Stamps Birthday Blog Hop! Sweet 'n Sassy Stamps is so excited to be celebrating four wonderful years! If you recall, I was blessed to be on the Design team from 04/08 until 01/10!!! 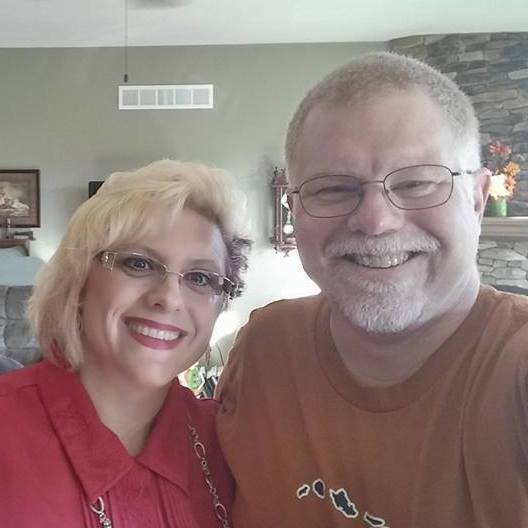 I love Korin and Sweet 'n Sassy Stamps and wish her and Dan a VERY Happy Birthday/ Anniversary!!! I am so thankful for the opportunity to work with them and to know them!!! Wishing them MANY more years of success!!! A fantastic group of Sweet 'n Sassy Stamps design team members past and present, along with some special friends, have put together this fabulous Birthday Blog Hop to kick off a whole month of fun. We have 36 stops so the hop will take place over three days - feel free to take your time visiting each blog! You have until 11:59pm EST November 9th to leave comments on as many blogs as you can. On Saturday, November 12th Sweet 'n Sassy Stamps will announce FOUR winners (chosen at random from comments on random stops along the hop); each lucky winner will receive a prize pack including stamps, dies, paper & twine valued at $40! This CD contains 70 pdf tutorials in step-by-step pictorial format -- all printable to 8-1/2” x 11” paper. This CD is ready to be mailed upon your order! Just click on the side bar to order your copy today! Thank you so much for stopping by! Have a blessed day!!! Both projects are just lovely! TFS! These are wonderful! I really love the gingerbread card holder! Lovely card and little purse. Love the gingerbread bag. Always love seeing new ideas. WOW! Both cards are stunning. Thanks! WOW - you are a rock star!! Fantastic projects!! Wow! Love both projects, the box is just great, thank you so much for creating and sharing them. Fab design!! Love that bag...cute! Sweet card Jess, love the doily and flowers. Wow, you have created so many different and fun things! Lovely! Both of your projects are fabulous! Love that little purse. That is such a clever container! your projects are so stunning and wonderful! Very lovely card! Thanks for sharing. What a cute little purse! Thanks! What great projects--I love the way card #1 opens, and the cute little gingerbread purse! Fabulous projects Chrissy. Love the purse. WOW! You've been a busy girl, and beautifully so. Your card and little purse are both just wonderful, and such perfect creations for this very special celebration! It's always great to see your work! Thanks so much for sharing!! What beautiful projects!!!! Love the colors and teh images! Love the coloring on the candle! Both are wonderful Chrissy. I love the top note purse is just adorable! Both projects are adorable. Thank you for sharing. I love all the cards you did. Really great job. WOW!!!! I really like the gift card holder. It looks like a fun project. Wow! Such talent! Love both projects! Oh my goodness, you've been busy! Great projects, Chrissy! Great projects! Really like the gingerbread purse. I recently complete card holders,now I want to do them all the time. Thanks for the inspiration. Stunning! I love the little purse. Love both of these projects! The little decorated purse box is adorable! Great projects. The purse is adorable! Chrissy, both projects are fabulous. My favorite is the gingerbread boy gift card box. Great idea, thanks for sharing!! 3D projects are so much fun!! Love the card fold too! Such a beautiful card both inside and out. Thank you for sharing. The stamps you used are great. I wish I could buy every one that has been used in this blog hop! Thank you for sharing. WOW, Chrissy...both projects are expertly done, but I especially love the gingerbread purse! What a sweet way to send thoughtful treats to a loved one! Love both projects Chrissy - I especially love that topnote purse!! Two great projects- I really like them both! I just got my CD- great fun to be had! I love the traditional look of your card and the purse is wonderful! That is a great idea for gift cards! Your coloring job is wonderful. Love the accents, too. I love that tri fold caard and he Top Note Purse. Who would not love to receive those. Those are awesome ideas , especially for this season. love them , thank you for sharing them with us. What cute projects!! Love that top note purse. that little purse is a keeper! So cute. Thanks for sharing. Cute purse! And that card ... WOW ... the colors are so brilliant and festive. Great job! Your sassy carolers are just ready for the snow! Love that top note purse, fabulous!! Beautiful. Love the way you folded your card and have a stamp inside. Love the projects. The gingerbread purse was very very cute!